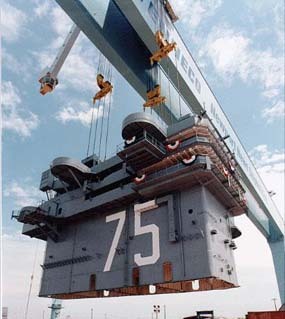 This is a complete list of all Newport News Shipbuilding production, listed in order by Newport News hull number. Small repair or overhaul jobs that were not assigned hull numbers are not included. The first column is the Newport News hull number, followed by the vessel's name, the type/size/class of the vessel, the owner/customer for the vessel, the type of work done (new construction, overhaul, etc. ), the date the vessel was delivered or commissioned, and the fate or status of the vessel. For ships that remain in existence the current name is listed in the status/fate column; if no name is listed, the vessel retains its original name. For US Navy vessels, the commissioning date is given; for all others, the delivery date is given.